Picard and h is crew struggle to save a small colony from certain destruction after Data shows them that there is trouble on the planet. Star Trek: Insurrection is the ninth film in the movie series and it became available in 1998. The crew of the Enterprise finds themselves in the middle of a sticky situation that could expand into a serious conflict. What will happen to the crew? What is the mystery behind this young world? You will have to watch to find out for yourself. To learn more about this wonderful film, you need to visit http://www.imdb.com/title/tt0120844/?ref_=fn_al_tt_1 for all of the details. 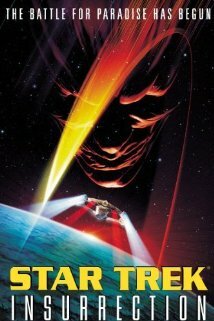 Star Trek: Insurrection gets a five out of five popcorns rating.